Apple Bloom was FRUSTRATED. Her big sister Applejack got to get all fancied up in sparkly new duds and go to what sounded like the greatest party in all of Equestria, WITH all her friends. And poor Apple Bloom was sitting in the Sweet Apple Acres barn all alone, just imagining the kind of fun they were having. And Apple Bloom couldn't go because she was "Too Young". Apple Bloom was sick to death of being told she was too young. Being the youngest (don't you dare say "baby") in an extended family as big as hers, nobody acknowledged that the young filly was growing up quickly and wanted to make a name for herself. Least of all her big sister! "Well, I'll show them! ", she yelled to the empty barn, tying the Cutie Mark Crusaders cape that her friend SweetieBelle had made (gold silk side out) with pink ribbon around her middle to serve as a dress. "I AM TOO old enough to go to the Gala! And maybe I'll even get my cutie mark there. Wouldn't that just show them all?" The little yellow filly with big ideas marched off towards Ponyville in her "finery" to go round up her cohorts (and best friends) Scootaloo and Sweetiebelle...If she could find them! In Ponyville, Tea Cozy was a wonderful older mare who kept a wonderful little darling cottage, and was always happy to help with the foals of the town, keeping watch over them when their guardian were busy. Miss Tea Cozy's house was rather busy this evening - so many of the adults were gone to the Grand Galloping Gala, and their foals scattered amongst the various caregivers of the town. Here was a small scene where some foals sat around a small table, perched on little stools, with a toy tea set laid out before them, and several stuffed animals sharing seats with the foals. Sweetie Belle happily sat there at the table, lifting a teacup before her, and pretending to take a sip. The little white unicorn had fake cardboard wings tied to her back, and a little cardboard crown perched lightly atop her pink-and-lavender curly mane. "I say," she said to the orange pegasus foal with a short-cut purple mane next to her, "This is a simply marvelous tea, Princess Scootaloo! It goes together marvelously with the cookies and cupcakes!" Scootaloo looked up at the cardboard horn that was slipping down her forehead and sighed. This was so lame! All of the adults got to go to the grand galloping gala and she was here playing with fake tea "Sweeeeetie Belllle" she whined, while pulling the cardboard horn off of her head "Why are we playing with this baby stuff! There isn't even real tea in these!" She knocked over her teacup and pouted at her best friend. This was the last place Scootaloo wanted to be, stuck at some baby party playing with baby toys. The gala was going on, and Scoot was positive if she was there she'd get her cutie mark somehow. "Can't we try to sneak out of here? we should be cutie mark crusading at the gala!" Scoot said in a hushed voice making sure that Tea Cozy couldn't hear her. That was how she ended up here, in a pretend tea party, pretending to serve tea to two of her schoolmates. It all seemed incredibly silly to her, but she so wanted to impress, wanted to make some friends, that she went along although it seemed so ... 'foalish'. She'd rather be outside, even if it was dark. So, when Scootaloo mentioned the idea of "sneaking out," her ears perked up. "Wait ... you want to sneak off to the gala? All the way in Canterlot? All night long? That sounds ... totally radical!" The turquoise filly smiled widely. She wanted to be responsible and all, yes, but the possibly of adventure was too great. After all, she hadn't been anywhere but school and Tea Cozy's home since she'd come to Ponyville, with no chance to explore yet. She was curious about one thing though ... "Like, umm, what the hay is 'Cutie Mark Crusading'? Like, is that a game?" Even if his aunty hadn't gone to the Gala, she'd suggested he go around to Tea Cozy's and help with the Gala babysitting. Seeing as miss Cozy was really getting close to having her little baby soon. So Starlight was currently going around, a tray atop his large head as he 'waited' the activity tables with sippy cups of milk and dishes of cookies for those that were still awake. He was happy to help out, especially since some of his school buddies were here aswell and seeing the girls cloistered around a table, he slide another tray onto his head and shuffled over with a big smile on his face as he did. Only hearing part of the conversation as he blinked and settled the tray on the table as he poked his head up next to Sunrise. Large purple eyes blinking curiously. "Are you guys talking about sneaking off to the Gala?" The little colt flopping his large ears atop his head as he blinked softly at the three fillies, chewing his bottom lip gently. "What if you get in trouble?" After checking the Carousel boutique and seeing it was closed, Apple Bloom knew that many of the foals, colts and fillies would be gathered at Tea Cosy's. Trotting in, she looked at dismay over the sheer crowd of younger ponies there, from babies to many of her school chums. "Oh no, how are we going to do this without getting caught!" she lamented. She spotted Scootaloo and Sweetiebelle standing near two other ponies, and looked at them with dismay. Sure, after she had told them her plan it'd be easy enough to sneak off in the confusion of Tea Cosy's house, but the problem was communicating her plan without letting the foals know. If Tea Cosy found out because one of the younger ponies tattled, they'd be done for! She sneaked over to where she was in Scootaloo's line of sight, but couldn't be seen by Sunrise beach and Starlight, stepping over discarded teacups and paper crowns littering the floor. She knew Scootaloo would be the easiest to convince, and once she was on board SweetieBelle would go along. Apple Bloom started trying to will the orange pegasus to look in her direction. "C'mn Scoot!" she pleaded with her eyes "make an exit so I can talk to ya!". She thought once that Scootaloo had spotted her, so she started jerking her head and motioning into the direction of the almost-empty hallway to a spectacularly less-than subtle effect. Sweetie Belle glanced around when she saw a motion out of the corner of her eye, seeing Apple Bloom there jerking her head around. Sweetie smiled happily and waved her hoof. "Oh, Apple Bloom! We're over here!" she said happily. "I made you a pair of wings and a horn so you can be a princess, too!" She smiled happily as Starlight came by with milk and cookies. he was so *adorable! * "Why, thank you very much, page!" she said cheerfully. "Princess Sweetie Belle is pleased." She took two of the cookies and moved them to her plate, then turned back to the others, with a worried expression. "Running off to the Gala?" she asked, with a worried tone. "Oh *my*... that sounds terribly dangerous, and even if we didn't get hurt, Starlight is right - we'd get in a whole lot of trouble! Can't we try for nice, *safe* Cutie Marks for a change?" Then she let out a soft *giggle* to Sunrise Beach. "Oh, Cutie Mark Crusading is where we try all sorts of different activities to try to find the one that will give us our cutie marks! We try out all the potential we have for still being able to be good at anything!" Scoot couldn't help but giggle as Apple Bloom made silly faces trying to get their attention, she gave a little nod to Apple Bloom so that she knew she was spotted. "Sweetie Belle! She wants us to go over to the hallway, not to come here to the tea party" Scoot said quietly. "Listen, I'll sneak over to the hallway first, then I'll tell you guys to come follow me. Tea Cozy would probably notice if we all start going missing at once. I bet Apple Bloom wants to go to the gala too!" and before Sweetie Belle could yell at her about getting in trouble Scootaloo took off. She made sure that Tea Cozy didn't see her as she moved towards the hallway, when the adult had her back facing the little foal, she quietly slipped out of sight. Scoot peaked around the corner at Sweetie Belle and made silly faces just like Apple Bloom did, then she waved her hoof motioning for Sweetie to sneak into the hallway. "The best thing about having best friends is that they almost always understand ya! "Apple Bloom thought to herself, satisfied that they were being sneak enough to not attract attention. First Scootaloo went into the hallway and motioned for SweetieBelle to join her. The little yellow filly did her best to get to that hallway through the most convoluted way possible: First crawling under a table, behind the arm chair, through the large potted fern, between the drapes, under the rug, and then finally to the hallway. She put one hoof to her mouth to muffle her whisper "Pssst, What do you say we sneak off and see what the Gala's all about? You just gotta help me convince SweetieBelle", before the gentle white unicorn joined them. Sunrise Beach was rather surprised at the little white unicorn's explanation of "crusading." Ã‚Â A group of foals trying to activity seek their cutie marks together? Ã‚Â Sunrise thought that it just happened spontaneously to most foals at that special moment, without activity working towards getting one beforehand. Ã‚Â At least that is how it happened to her. Ã‚Â As she thought about it, maybe she was the odd one out, as she moved around too much to really have friends before. Ã‚Â Maybe most foals did this crusading, and she just never had heard of it before. Ã‚Â With that in mind, she became all the more curious - besides, the idea of sneaking off to some new place was too much of a temptation not to join. It was then she noticed the yellow earth pony with the bow in her red mane gesturing wildly towards them. Ã‚Â Like, is she trying to be subtle, because she's, like, doing a bogus job at it. Ã‚Â Was she someone everypony else here knew? Ã‚Â She wasn't being discreet enough to just get any single pony's attention. Ã‚Â It was then she noticed the orange pegasus make her way over to the newcomer, making a show of her sneaking around. Ã‚Â Sunrise couldn't help but snicker at that. She was also way too curious. Looking over at Starlight, she smiled, "I'll be right back, I like, just gotta know what is going on over there that is such a biiiig secret". Ã‚Â No need for special tricks, Sunrise simply waited for the right moment and quietly trotted straight down the hall to the other two, she knew how to be light on her hooves. "Sooooo, like, what are you up to??" Sunrise asked Scootaloo rather coyly, knowing something mischievous was in the works. Ã‚Â "Don't worry.. I won't tell!" She made the crossing gesture over her chest, then touched her hoof to her closed eye. Ã‚Â She didn't bother with the words they all knew: Ã‚Â Cross my heart and hope to fly, stick a cupcake in my eye. Ã‚Â She looked over at the yellowish earth pony, "Oh, like, i almost totally forgot, my name is Sunrise Beach, and yours?" Watching the girls move off, she shared a faintly worried look with Sweetie Belle, they could get into a lot of trouble and as much as he liked the girls. They were his friends, how could he possibly dislike them! He was scared for their tooshies if their family members found out they'd snuck off and he rested his chin on the table surface for a moment or two as he watched Sunrise and Scootaloo sneak off. Moving over to Sweetie's side he looked at her briefly before looking over to the potted ferns. "You think miss Tea Cozy will be mad at us?" She sighed, and got to her hooves. "You can stay here if you want, Starlight," she said to him softly. "But I need to support the Cutie Mark Crusaders!" Then she headed off, her little legs hurrying her around the ferns to meet up with everyone else, her little white cardboard wings bouncing over her back. She gave a wan little worried smile. "Hey, girls! Apple Bloom, I have a costume for you, too, so you can be a princess! I mean, this'll be way better than a real Gala... Rarity said that Rainbow Dash was sooooo bored last year, and that AppleJack didn't have any fun, either. And just because they're going back again this year doesn't mean... that is ... you probably won't ..."
She paused and gave a soft sigh. She knew her friends ... there was no point to arguing. "We're going to the gala, aren't we?" She rolled her eyes and started to take off her cardboard wings, suddenly all businesslike. After all... she knew her friends would be bored... but SHE knew that SHE would love the gala! "OK. What are we gonna wear, and how are we gonna get there?" She eyed Apple Bloom's getup. "The inside-out capes are a nice idea, but we'd at LEAST need to add a nice white saddle to the gold skirts! And Sunrise will need something to wear, too!" Scootaloo watched Apple Bloom sneak all over the place before finally getting over to the hallway, she loved that filly to death but sometimes she was just a little weird. Soot put her hoof up to her mouth just like her best friend did and whispered "I had the same exact idea! this place is so boring and Sweetie Belle is trying to make me drink pretend tea!" Before the two of them had more time to talk on their own another little filly trotted right up to the pair, as if she wasn't even trying to be sneaky! "Well as long as you PROMISE not to tell" Scoot looked at her seriously "We want to go to the gala!" 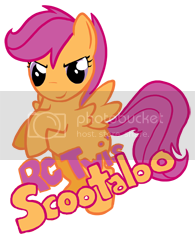 she gave the filly a little nod as she introduced herself "I'm Scootaloo". Scootaloo kept looking over to Sweetie Belle waiting for her to get over to the rest of the girls. She was taking forever! Finally after talking to Starlight a little bit she trotted over, with her little cardboard wings still on her back. Sweetie jumped right into a speech about how lame the gala would be, and how nopony had any fun last year. Going on about how it the fake gala would be better. Scootaloo almost felt bad, she knew Sweetie put a lot of work into making everypony's princess costumes. Luckily before Scoot could even say anything, her friend realized it was pointless to argue and in the blink of an eye the almost seemed excited for this plan! "Well Sweetie Belle what did you have in mind? we could always see if Rarity has anything pretty in the shop!" She looked around to see what the other fillies thought of that idea. "Oh hi Sunrise Beach, it's nice to meet you. I'm Apple Bloom", the yellow filly smiled at the newcomer. "I do gotta say one thing, though, if you tell on us, you'll be sorry", she added, grinning and taking up a mock Karate stance. She looked back over at Scootaloo and Sweetiebelle, "Yeah, Rarity's shop would be just the thing! We could find all we need there!" she lowered her voice a little bit "But then how are we gonna get to the Gala? Look at the clock! We only have a few hours left!" She looked back around to see if anypony else was listening in. Then she looked up, and directly above her head Tea Cozy was looking right back at her. "Busted. ", thought the filly sadly, resignedly she turned to her unicorn friend. "Sweetiebelle, can you please pass a pair of those cardboard wings?" Continued in: Sleepover in Sequins.